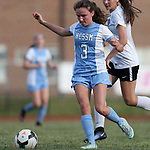 High School Women's Soccer. NCSSM 3:2 DSA at Durham School of the Arts. Photos by Andy Mead/YCJ.